The Ford F-150 truck is already a very popular ride as one of the best-selling vehicles in the United States. For some people, the standard F-150 lacks power and style. Roush has a new package it will add to the F-150 that adds style, utility, and gobs of power. 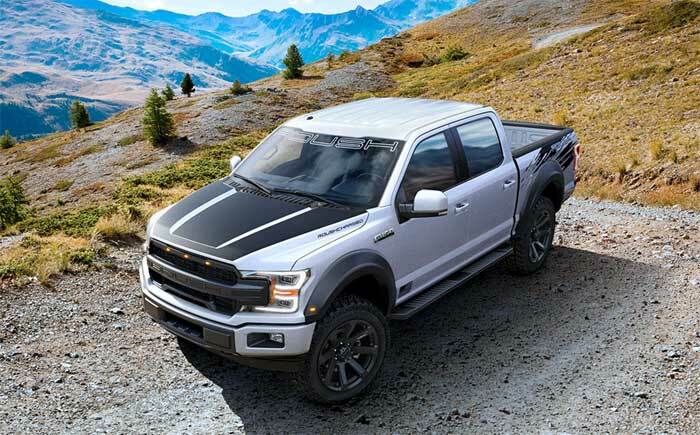 The truck is the Roush F-150 SC and the heart of the truck is a supercharger for the standard 5.0L V8 that brings power up to 650 hp and 610 lb-ft of torque. It also gets special Roush wheels and all-terrain tires. A Roush/Fox 2.0 Performance Series coilover suspension is added that raised the truck 2-inches in the front. An optional adjustable exhaust system can be added along with special leather interior, graphics, and other touches if desired. The F-150 SC base package adds $22,999 to the starting price of the F-150. Options aren’t priced at this time. This truck is a more off-road focused version of the Nitemare truck we talked about before.